Recently a fun box showed up at our door. Two boxes, actually. One was full of some of the BEST yogurt ever from Nancy’s and the other was filled with gorgeous raw juices of all flavors, from Genesis. Needless to say, I pondered. What could I create with these two wonderful ingredients? Smoothies, sure! But that’s a given. So I grabbed a piece of paper and I scribbled out an idea for this Overnight Oats recipe. I calculated the calories, protein and fiber and bam….it was a winner. This my friends, is a complete meal and let’s not forget all the billions of live probiotic cultures this recipe packs! As I sit here, excited to share this with you all, I can’t help but feel like this couldn’t be more timely. Baseball season has just started for us and with 1, 2, 3 or more kids in sports, it’s more important than ever to stay well-fueled, without a fuss. These overnight oats look pretty, when they sit in my fridge waiting for me. 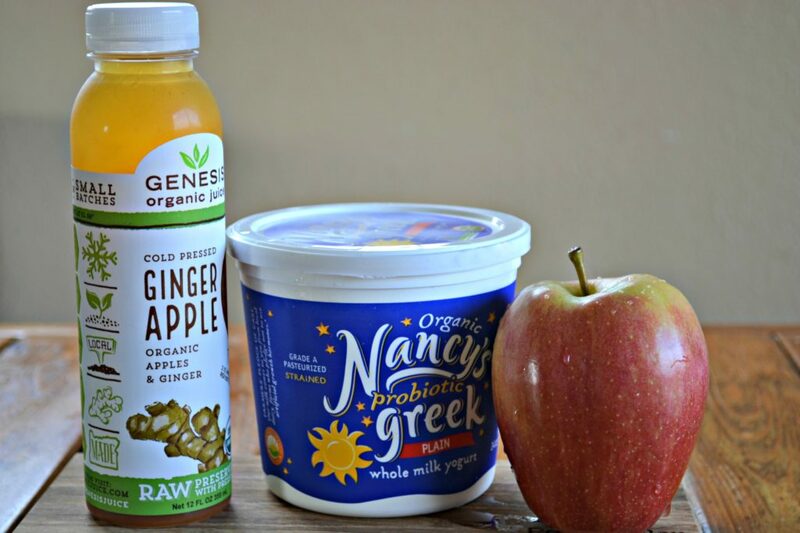 Let’s face it, anything healthy in a jar, is a happy thing, isn’t it?When I combined Nancy’s Probiotic Greek Yogurt, with Genesis Raw Ginger Apple juice, it was a match made in heaven. This recipe is full of protein, vitamins, fiber and it’s a relatively low-calorie (but still filling!) meal, coming in at just about 360 calories! In a mason jar, first measure in the oats. 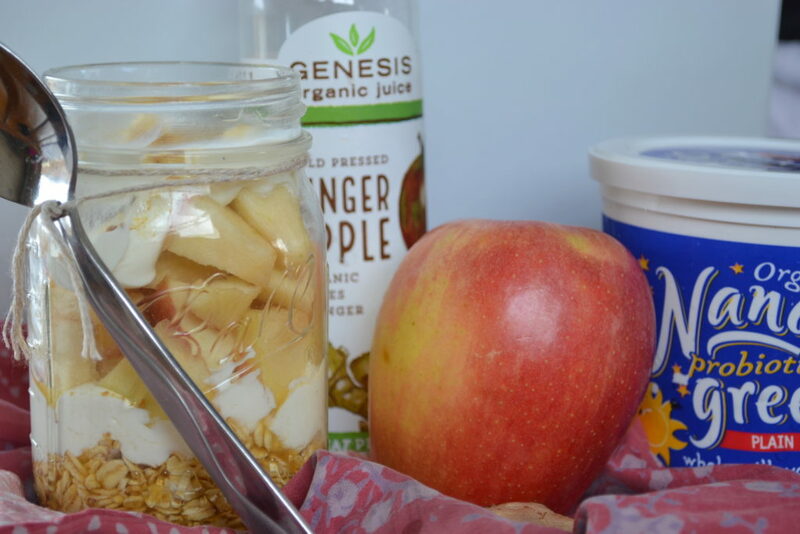 Pour the apple juice over and then layer in ½ of the yogurt, the chopped apples and then the other ½ of the yogurt. Top with a sprinkle of ginger. Allow to sit in the refrigerator overnight or for at least 4 hours before enjoying. Each serving contains roughly 360 calories, 18 grams of protein and 7 grams of fiber. Talk about a healthy meal! A big thank you to Nancy’s and Genesis for providing ingredients for this post. As always, it’s an honor to work with brands I truly love feeding my family! 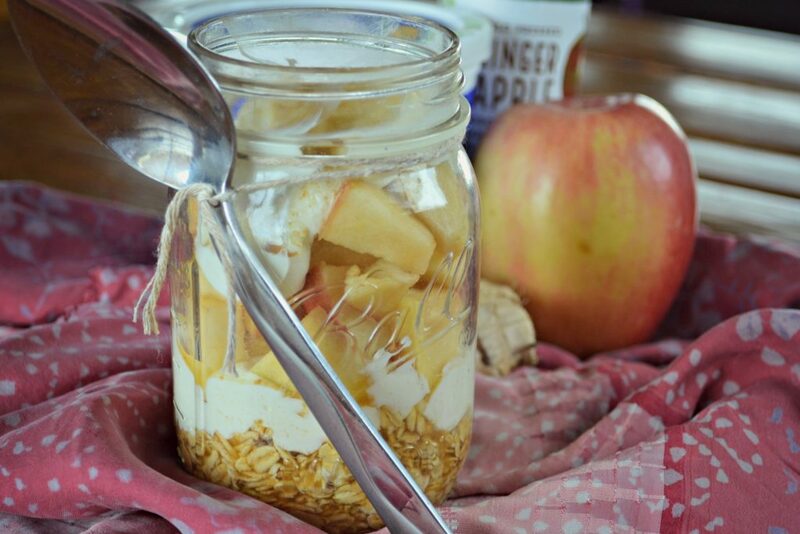 Do you make overnight oats? If so, what do you enjoy putting in them?